The deposit for the wedding date is $100.00 (non-refundable) plus a signed contract to reserve and guarantee your wedding date with your artist. Please note that booking a trial session does not guarantee reservation for your wedding day. 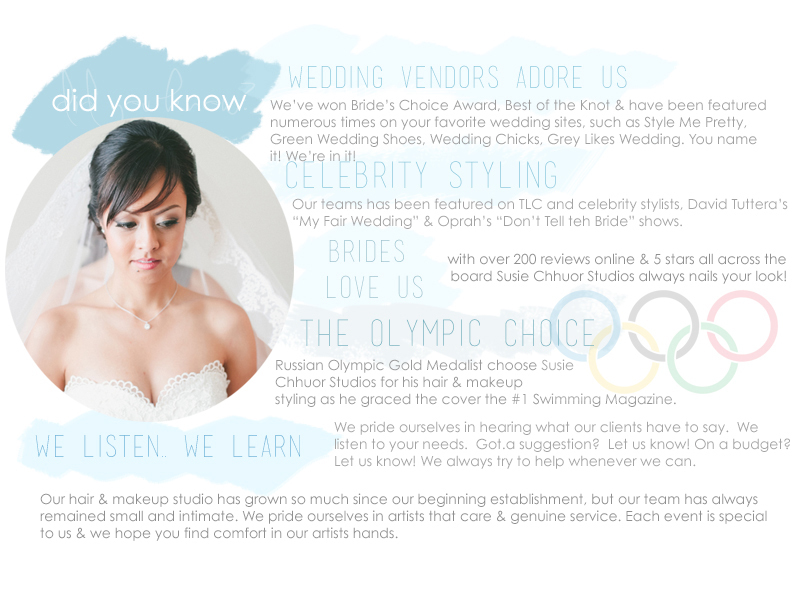 Susie Chhuor Studios books services based on a first come first book basis for wedding days. If you have a trial session scheduled and there is another client interested in retaining our services, we would provide you with a courtesy email and let you know that someone may or is in the process of reserving your wedding day. Thereafter, we will provide other alternative options with your team. The balance is two weeks before the wedding or earlier. You will be contacted if you have not sent in a check for the balance. We accept both cash or check payments. Credit Card (Visa and Master) is available upon request. Transaction fees are the responsibility of client. Please note that balances do not include gratuity for your artist(s) and that this can be made payable on the day of the wedding or if you include it in your remaining balance check that you send it will be disbursed to your client accordingly. What happens if I need to change my wedding services? Because we book events in advance with our clients, our schedules are typically pre-set about 1 or 2 months in advance. This means that we book our artists and any assistants needed for your special event. In order to respect our artists time and our schedules, we have a strict policy that no deductions (taking out) be made to any service list if the event is within two weeks of the request. Additions may be added onto the service list. Request to deduct services is acceptable if more than two weeks prior to the event date. For example, if you wedding is on 05/15 and you contact us on 05/10 to let us know that you will no longer need hair and makeup for two mom’s, you will still be responsible for the payment of these services and we highly recommend that you find someone to take their spots. What if I need to cancel my services? If you are canceling, due to unrelated personal reasons, we ask that you provide us with a written notice (via email or formally via regular mail). Should you need to cancel your services with us you will forfeit any deposit payments made with our studio in addition to 1/2 the balance originally due on the wedding date. What happens if S Studio cancels on my event? Susie Chhuor Studios has never in the past canceled on our customer’s wedding date. In the event that we are no longer able to accommodate your needs, we will find a replacement artist for you as well as refund you for any payments you’ve made to us. Products vary from artist to artist on our team as we each have our own holy grail.However, some products that we cannot live without include those from brands ranging from Nars, MAC, Bobbi Brown, Make Up Forever. Of course, there is more than listed. We use various products for different parts of the face and accordingly to our brides needs as we specialize the application for the best results. For example, for the skin we will use a mattifying foundation instead of a standard foundation, if you tend to be on the oilier side. For skin that is dry, we will use something that is a bit more moisturizing, and so forth. All of the products used have been tried and tested to ensure quality and longevity. We understand the importance of long lasting cosmetics as well as good quality cosmetics for both photography purposes and skin health. What is the difference between airbrushing & traditional foundation? 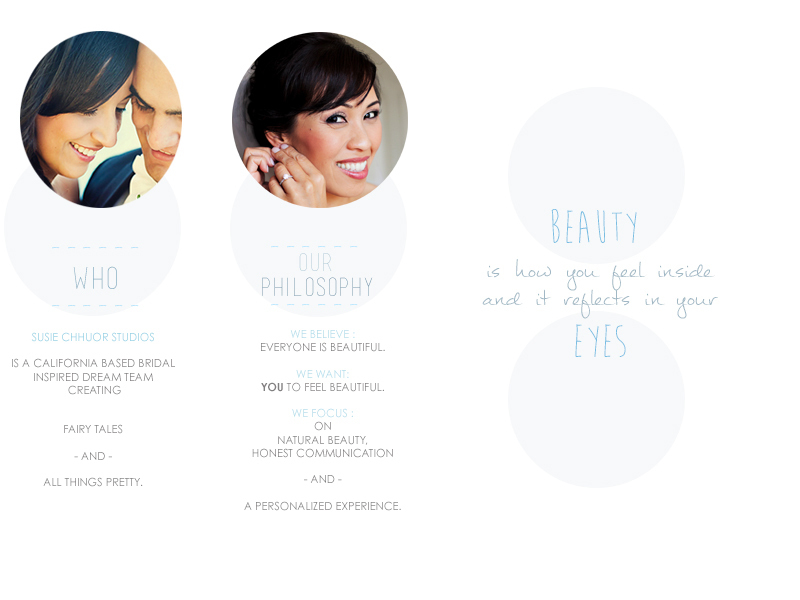 Everyone is different and makeup comes in a wide range of formulas and options. It is important to understand these differences between traditional makeup application & airbrushing. We use Temptu airbrushing system, which is the grandfather of airbrushing/first to develop this system. They are the first to come out with a consumer line that can be purchased in regular cosmetic stores like Sephora. Our team uses high quality and well known brands that are specifically catered for photography purposes, yet still keeping in mind that our brides want a free look, nothing cakey or too heavy. Although airbrushing stays on longer than traditional makeup, the silicon base formula is not universally ideal for everyone. For this reason we always tell our clients to test out the makeup first to make sure it will be a compatible fit.